As a human being, we must wear clothing to hide our body, especially private parts of our body. There are no other alternatives to textile to make garments products. Every year the textile industry is producing a huge amount of effluent which is ultimately dumping into river, canal. This effluent creates extensive environmental pollution. It’s polluting our water, air, and soil. As we are responsible for creating effluent in textile, we must take effective measure to minimize this problem. Environmental expert and regulatory agencies suggest that we must do effluent treatment in the textile industry to get rid of environmental hazards. It is the time to think of effluent treatment in textile industry otherwise our water environment will be a curse for us. In a textile industry effluent is produced because we use a different chemical which is not environmentally friendly and also because of using different chemical components at a time, it creates effluent. Basically, the effluent is produced especially in the dyeing section, washing section and printing section of textile. Environmental regulatory authority and garments buyers are now more concern about management of effluent created by textile. That’s why the textile owner is now investing a huge amount of money to make effluent treatment plant. 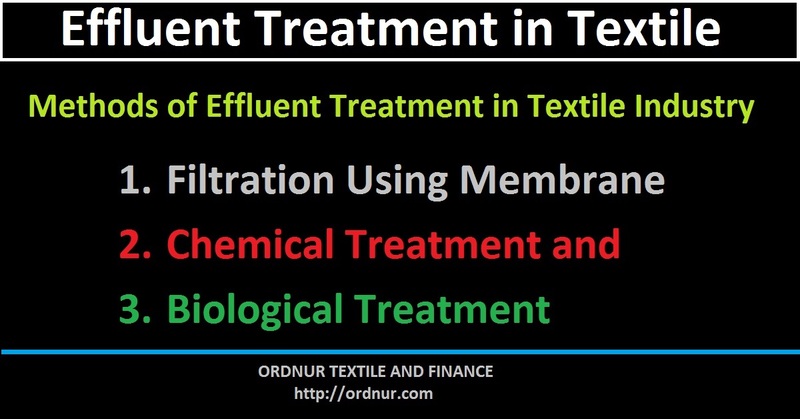 Scientists have developed many processes of effluent treatment of textile. Normally we find there are three broad categories of a treatment process. Reverse Osmosis: Reverse osmosis is one of the costly treatment procedure where effluent is pressed and passes across a semipermeable membrane. After that, a relatively clean effluent and concentrate of toxins are formed which need to dispose of separately. The permeate will still contain a small amount (about 20%) effluent is to be there as untreated. And cleaning of the membrane is required to done time to time. Nanofiltration: Nano Filtration uses membrane as a filter of effluent. In this process of filtration, it retains any materials contains a molecular mass of more than 200. But permeate may still contain a high level of inorganic salt and for this reason, it cannot be used for recycling. The concentrate will contain organic impurities and many organic impurities may require further treatment. If you require more than one filtration process, then it will add more cost which is not expected. Microfiltration: Microfiltration is used to reduce suspended solids and organic materials. The size of the materials is .02mm or more. By this process, you will get solid sludge which is needed to be carefully disposed of. Microfiltration is suitable for minimizing chemical oxygen demand and suspended solids. Chemical treatment is popular for its effectiveness and economic beneficial perspective. In this process, sedimentation is used for separating effluent. Normally chemical is used to form a precipitate and it will absorb the color and other unwanted materials in the effluent. For biological treatment, effluent should contain nitrogen and phosphorous so that it can populate good microorganism. In a biological treatment plant bacteria and microorganisms convert effluent into bacteria which is environment-friendly and is not bad for the water. Although the biological treatment plant is more environmental friendly for this type of plant, the initial investment is more. Tagged Biological Treatment, Biological Treatment of Textile Effluent, Chemical Treatment and, Effluent Treatment and Waste Disposal in Textile Industry, Effluent Treatment in Textile Industry, Effluent Treatment In Textile Industry pdf, Effluent Treatment in Textiles, Effluent Treatment of Textile, Effluent Treatment of Textile Industry, Effluent Treatment Plant in Textile, Effluent Treatment Plant Textile Processing, Effluent Treatment Process in Textile Industry, Effluent Water Treatment in Textile Industry, Elluent Treatment in Textile Industry, Filtration Using Membrane, Methods of Effluent Treatment in Textile Industry, Microfiltration, Nanofiltration, Reverse Osmosis, Treatment of Textile Mill Effluent.